Have scientists really found something tougher than nature's invincible material? 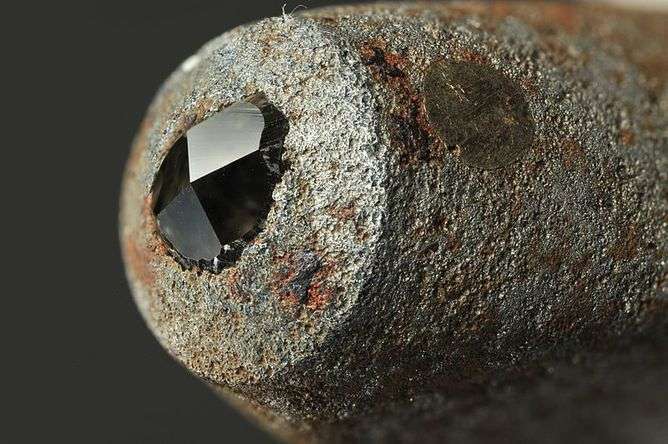 Ask most people what the hardest material on Earth is and they will probably answer "diamond". Its name comes from the Greek word ἀδάμας (adámas) meaning "unbreakable" or "invincible" and is from where we get the word "adamant". Diamond's hardness gives it incredible cutting abilities that – along with its beauty – have kept it in high demand for thousands of years. Modern scientists have spent decades looking for cheaper, harder and more practical alternatives and every few years the news heralds the creation of a new "world's hardest material". But are any of these challengers really up to scratch? Despite its unique allure, diamond is simply a special form, or "allotrope", of carbon. There are several allotropes in the carbon family including carbon nanotubes, amorphous carbon, diamond and graphite. All are made up of carbon atoms, but the types of atomic bonds between them differ which gives rise to different material structures and properties. The outermost shell of each carbon atom has four electrons. In diamond, these electrons are shared with four other carbon atoms to form very strong chemical bonds resulting in an extremely rigid tetrahedral crystal. It is this simple, tightly-bonded arrangement that makes diamond one of the hardest substances on Earth. Hardness is an important property of materials and often determines what they can be used for, but it is also quite difficult to define. For minerals, scratch hardness is a measure of how resistant it is to being scratched by another mineral. There are several ways of measuring hardness but typically an instrument is used to make a dent in the material's surface. The ratio between the surface area of the indentation and the force used to make it produces a hardness value. The harder the material, the larger the value. The Vickers hardness test uses a square-based pyramid diamond tip to make the indent. Mild steel has a Vickers hardness value of around 9 GPa while diamond has a Vickers hardness value of around 70 – 100 GPa. Diamond's resistance against wear is legendary and today 70% of the world's natural diamonds are found in wear-resistant coatings for tools used in cutting, drilling and grinding, or as additives to abrasives. The problem with diamond is that, while it may be very hard, it is also surprisingly unstable. When diamond is heated above 800℃ in air its chemical properties change, affecting its strength and enabling it to react with iron, which makes it unsuitable for machining steel. These limits on its use have led to a growing focus on developing new, chemically-stable, superhard materials as a replacement. Better wear-resistant coatings allow industrial tools to last longer between replacing worn parts and reduce the need for potentially environmentally-hazardous coolants. Scientists have so far managed to come up with several potential rivals to diamond. The synthetic material boron nitride, first produced in 1957, is similar to carbon in that it has several allotropes. In its cubic form (c-BN) it shares the same crystalline structure as diamond, but instead of carbon atoms is made up of alternately-bonded atoms of boron and nitrogen. c-BN is chemically and thermally stable, and is commonly used today as a superhard machine tool coating in the automotive and aerospace industries. But cubic boron nitride is still, at best, just the world's second hardest material with a Vickers hardness of around 50 GPa. 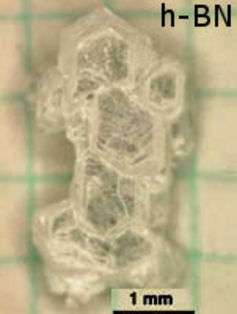 Its hexagonal form (w-BN) was initially reported to be even harder but these results were based upon theoretical simulations that predicted an indentation strength 18% higher than diamond. Unfortunately w-BN is extremely rare in nature and difficult to produce in sufficient quantities to properly test this claim by experiment. Synthetic diamond has also been around since the 1950s and is often reported to be harder than natural diamond because of its different crystal structure. 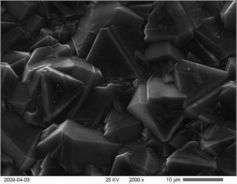 It can be produced by applying high pressure and temperature to graphite to force its structure to rearrange into the tetrahedral diamond, but this is slow and expensive. Another method is to effectively build it up with carbon atoms taken from heated hydrocarbon gases but the types of substrate material you can use are limited. Producing diamonds synthetically creates stones that are polycrystalline and made up of aggregates of much smaller crystallites or "grains" ranging from a few microns down to several nanometers in size. This contrasts with the large monocrystals of most natural diamonds used for jewellery. The smaller the grain size, the more grain boundaries and the harder the material. Recent research on some synthetic diamond has shown it to have a Vickers hardness of up to 200 GPa. More recently, researchers at North Carolina State University created what they described as a new form of carbon, distinct from other allotropes, and reported to be harder than diamond. This new form was made by heating non-crystalline carbon with a high-powered fast laser pulse to 3,700 °C then quickly cooling or "quenching" it – hence the name "Q-carbon" – to form micron-sized diamonds. The scientists found Q-carbon to be 60% harder than diamond-like carbon (a type of amorphous carbon with similar properties to diamond). This has led them to expect Q-carbon to be harder than diamond itself, although this still remains to be proven experimentally. Q-carbon also has the unusual properties of being magnetic and glowing when exposed to light. But so far it's main use has been as an intermediate step in producing tiny synthetic diamond particles at room temperature and pressure. These nanodiamonds are too small for jewellery but ideal as a cheap coating material for cutting and polishing tools. Centaurus Diamond Technologies alleges they can create diamond in a fraction of a second by collapsing a powerful electromagnetic field around an aluminum tube packed with carbon of one type or another, and by orders of magnitude less expense. The process is patented by Alvin Snaper. They claim progress after a re-organization, but I still haven't seen proof that it works. If it does, the process might apply also to synthesizing boron nitrides or "Q-carbon". ...collapsing a powerful electromagnetic field around an aluminum tube packed with carbon... They claim progress after a re-organization, but I still haven't seen proof that it works. If it does, the process might apply also to synthesizing boron nitrides or "Q-carbon"
Indeed, such a process would be easy to test, if at least at the micro scale but, at low cost. The plethora of youtube videos might give the amateur zealous experimenter opportunity to craft equipment rivaling corporations and with those efforts inspire others to test professional approaches with more detail. Together with the real cost of energy dropping and wider use of the internet in some educative capacity heralds an interesting future delving into new materials & the huge number of permutations needed to explore variations. "Given 99% of the the scientists who ever lived in all history are alive today the human race could be in for an exciting future"
True but sadly a large number of them seem more interested in fraud for fame, financial and ideological reasons that actually expanding knowledge. This is especially true in the so-called 'soft' sciences given that it is so much easier to manipulate results than in the 'hard' sciences. Pretty much any science study that impinges on politics should be viewed with great skepticism. Frankly the only thing I can think of, is that to make a better, stronger material, you have to follow the most basic principles of how molecules generate their bond, and how they lose it, and it is always the same way, friction of said molecules to beyond that level of friction and pressure which generated the bonds. So in this, I can only conclude that to make a better material than diamond, you would need to generate a higher heat, and pressure, along with a better timetable for the carbon molecules to bond. and these conditions, being far superior to the task you expect to use the product for, so that the tolerances of the material in use, will not be greater than the construction process variables, superseding such would result in the materials decomposing. Hard material science is hard. @tblakely: In claims concerning science use science, references please. Else if it is negative it is pretty much trolling. In case it was a serious claim, the found frequency of publication fraud is ~ 1 % IIRC [I think Retraction Watch links to data analyses], which is both small enough to explain why science is useful and is comparable with other areas of society. That isn't as good as one could hope considering the routine oversight (peer review), but the amount is else as expected in a competitive environment. 2 What is the sample size ? 3 Have you ever worked with a "scientist" ? 4 What particular 'soft' sciences ? 5 Are they peer reviewed ? 6 Have you ever met any ? 8 Affects *the* political process vs is affected by ? 9 Are you aware of the Scientific Method ? I'm sure can consider precision/evidence helps ? The title is very misleading. Diamonds many be exceedingly hard, but they are far from being the toughest natural material. Pretty much any science study that impinges on politics should be viewed with great skepticism. Presumably you feel the same way about religion?